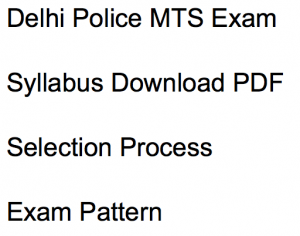 Delhi Police MTS Exam Syllabus 2018 Written test pattern, selection process: Delhi Police recruitment department has invited online application from eligible candidates for the Non-Gazetted post of Multi-Tasking Staff (Civilian) Group-C and the trades are – Cook, Water Carrier, Safai Karmachari, Mochi / Cobbler, Dhobi / Washerman, Tailor, Daftri, Mali /Gardener, Barber and Carpenter. The online application procedure that has started from 17th December 2017 will continue till 16th January 2018. The candidates passing 10th standard or equivalent or possessing ITI in the respective trade will be eligible for the application. The date of the written examination that will be conducted first, has not been declared by the recruitment authority yet but as it gets announced we’ll inform the candidates through our website www.jobsandhan.com immediately. We have discussed here Delhi Police MTS Written Test Exam Syllabus 2018, Selection Process and other information useful for the upcoming recruitment test scheduled to be held on this year. 7 Safai Karamchari 237 Posts. 8 Water Career 54 Posts. The selection of the Multi-Tasking Staff (Civilian) Group-C Non-Gazetted post will undergo two steps of sieving process. The first step is Written Test that will be common for all the trades like Cook, Water Carrier, Safai Karmachari, Mochi / Cobbler, Dhobi / Washerman, Tailor, Daftri, Mali /Gardener, Barber and Carpenter. Then on the basis of the performance of the candidates in the written test, 4 times the total number of vacancies in each category will be called for Trade Test. The written examination will be common for all the trades and it will be OMR based Test with objective MCQ types questions. Total 100 questions will be there to answer. Language of the Question Paper: The question will be bilingual i.e in Hindi and English. The test will carry 100 marks in total and the time duration will be 90 minutes. There will be three parts of the question -Part-A, Part -B and Part -C. Part-A and B will carry 25 marks each and Part-C will bear 50 marks. The candidates shortlisted on the basis of the marks obtained in the Written Test need to appear for the Trade Test. It will be qualifying in nature and consist of 20 marks in total. This test is going to be separate for each of the trade. एडमिट कार्ड डिपार्टमेंट कब छोड़ेगा ? इस बार कट ऑफ मार्क कितना हो सकता है ? कैसे प्रिपरेशन करेंगे आप लोग ?इस तरह कोई भी प्रश्न आप लोगों के पास है तो आप हमारे साथ शेयर कीजिए कमेंट बॉक्स के माध्यम से.